With their kids out of the nest and the future looking promising, Howard and Nancy Altman set out several years ago from their San Anselmo, California, home to go boat shopping. They knew, Howard recalls, that it would have a single diesel engine, a displacement hull-not much in the way of speed- and that they would be content exploring Pacific Northwest waters aboard this boat. What else would you expect from avid readers of PassageMaker Magazine, he asks? Recently, I met the Altmans, and the boat they bought four years ago, at the Roche Harbor Resort and Marina on San Juan Island in Washington State. They were attending the annual rendezvous of the Tollycraft Boating Club of Puget Sound. Yeah, they bought a Tollycraft. It has everything they weren&apos;t looking for: A pair of gasoline-burning engines and a lot more speed than a putt-putt single-engine passagemaker. They are happy people, however. Howard and Nancy hadn&apos;t found their dream slow boat in the San Francisco area, where he works as an architect. "It had been a long search and there had been disappointments," he recalls. So they expanded their search to Seattle. While looking for a trawler-type yacht in Seattle, they saw a 34-foot Tollycraft sundeck yacht on a dock. "We didn&apos;t know what it was," Howard explains, "but it was not what we wanted." They moved on, looking and looking. Nothing clicked. The salesman urged them to take a look at the Tollycraft. Just take a quick look, he pleaded. "It was the best thing we ever did," Howard says. Howard obviously has told this story a hundred times or more. Nancy feared he was boring me and hinted to Howard that he should skip the details. But I was fascinated because I had come to Roche Harbor to learn about Tollycrafts and their owners, and here was a charming couple with a handsome yacht. I was not bored. Why, oh why did they buy that Tolly? They like the aft master stateroom, its walkaround berth, and its full head. A guest stateroom and head forward offer privacy for friends cruising with them. The covered sundeck was a plus, as was the high quality of the teak interior. The boat was built in 1987, but she looks new inside and out. Although 800 or so 34-foot Tollycrafts were built, few share the sundeck configuration of the Altmans&apos; Nuance. "There is a mystique about these boats," Howard explains. "A finite number were built, and I have not heard of or seen anything of its equal." The Tollycraft is a quintessential Pacific Northwest boat that was built from the 1960s through 1996. Many Tollycrafts were sold in-and still live in- Washington, Oregon, California, Idaho, and British Columbia. But eventually, they began showing up in the Great Lakes, along the East Coast, and in Florida. The boats in the Tollycraft line were designed first by Ed Monk, a world-famous Seattle designer, and later by his son, Ed Jr., an equally esteemed naval architect based in Bainbridge Island, Washington. The boats were built in the Tollycraft factory in Kelso, Washington, a logging and fishing community 125 miles south of Seattle on the Columbia River. The man who built them, Robert Merland Tollefson, is a Northwest native who now lives in retirement in Port Ludlow, Washington. When Howard and Nancy bought Nuance, it turns out, they got a lot more than a boat. They found another family when they joined the Tollycraft owners&apos; club. "There is a camaraderie, a friendship, a band of brothers," Howard says. "We are not joiners, but we fell in with this group, and if you have a problem, someone will help you." Howard believes owning the Tollycraft has strengthened their marriage, too. "We have seen other couples grow apart without similar shared interests," Howard explains. "We have found a passion here we are sharing equally, and to me, that is a wonderful thing." Wow, all that from a boat. Believing that the huge fleet of Tollycraft boats may have been overlooked by shoppers looking for cruising yachts, my wife, Polly, and I decided to spend some time at the Tollycraft Boating Club rendezvous. The idea was to check out the boats, and we did. But we also heard some great stories and met many nice people. The Tollycraft story began almost 50 years ago. Tollefson (Tolly from here on, because that&apos;s how he&apos;s known everywhere) built boats for himself while operating a sawmill in Kelso. When the mill burned in 1957, he switched to boat production, and over nearly four decades, the company built and launched about 6,500 boats, making Tollycraft one of the nation&apos;s most prolific boatbuilders. Many were small (16-, 18-, 20-foot runabouts built of plywood sheathed with fiberglass), but in the 1960s Tolly began building larger, all-fiberglass boats-often introducing several new and longer models each year. By the time the comp26 any failed financially and closed about a decade ago-years after Tolly sold the business-the flagship was a 65-footer, and more than 3,000 yacht-type boats had been built. The most popular boat was a 26-foot sedan. Tollycrafts built nearly 900 before halting production because new boat sales lagged when buyers turned to the competition-used 26 Tolly sedans that sold for a little less than a new boat. Or so goes the story. There are many 26-foot sedans on the market today, selling for up to $30,000. They are gas powered, although a few owners have installed diesel engines. My first inclination is to say the 26 Tollycraft would be an exciting weekender but that it does not have cruising potential. Then I remember that Robert Hale, publisher of the Weatherly Waypoint Guide and the Waggoner Cruising Guide, and his wife, Marilyn, did the research for the first several annual issues from aboard their 26 Tollycraft, beginning in 1992. The cruising guide covers destinations from the south of Puget Sound to Prince Rupert in northern British Columbia. Hale made all the major crossings of straits and sounds open to the Pacific in the little boat, and, with a friend aboard (Marilyn had decided to stay home), circumnavigated Vancouver Island. The waters off the north shore of the island, particularly around Cape Scott, and farther south at Brooks Peninsula, can be violent and dangerous. Hale, a good seaman and experienced sailor, made the trip safely in the 26. So it does have cruising potential, as do many other boats in the Tollycraft family. Since then, Hale has moved up to a 37-foot Tollycraft, Discovery. He and Marilyn spend 9 to 11 weeks aboard each summer, doing research on anchorages and marinas and finding new friends along the Inside Passage-from Olympia, Washington, to the Canada-Alaska border. Discovery is a sound cruising yacht. Many believe the 37 is the premier boat in the Tollycraft fleet. A friend recently sold a Grand Banks and bought a 37, then immediately cruised into foul weather on Haro Strait. "I just couldn&apos;t believe how well she handled," he told me later. Gordon Graham, a former Tollycraft administrator and now a supplier of Tolly parts, knows every boat well. "The 37," he says, "is one hell of a boat. The 37 galley down was a favorite." I once asked Tolly to name one of his boats as the best. He owned and cruised a 48-footer until a few years ago, but he said the V-bottom boats-the 26-, 28- and 37-footers-"were the best running hulls of all." The 37s seldom are advertised and sell by word of mouth, mostly among club members. I checked yachtworld.com and other Internet listings and found only one 37 for sale in the United States, a 1976 model with gasoline engines, which was listed at $65,000. Only 150 of the 37s were built, which explains why the popular boat is hard to find. Tollycraft owner Gary Nelson spends so much time cruising that he has trouble coming up with a permanent address. He now owns a sparkling 48-foot sedan, but he owned a 37 Tolly for 27 years before moving to the larger yacht about a year ago. "The 37 is a very good boat," he says. "It has a reputation for being seakindly." Nelson cruised the 37 to Skagway, Alaska, and around Vancouver Island. "I would take that boat anywhere," Nelson adds. "I&apos;ve taken that boat through water I shouldn&apos;t have." In 1998, Joan Hammond, a resident of North Vancouver, British Columbia, was driving to a shopping mall just across the international border in Bellingham, Washington, when she noticed an unfinished boat parked in a boatyard. It turned out to be a 37 Tollycraft. She bought it for $32,000, and she and her husband, Tom, spent more than a year finishing it. The Cummins 504 diesel engines (rated at 210hp) were in boxes, Tom recalls, and the interior didn&apos;t exist. Tracking its history, he learned the boat was a 1986 model and may have been the last of its kind built. It had sat in a barn for 12 years before Joan spotted it. The deckhouse and flybridge had been attached to the hull. But it was up to the Hammonds to complete the interior. "I did the grunt work," Tom says. But he hired professional help for the engine and marine electronics installations. Doing the grunt work was somewhat costly: Tom sliced off a piece of his thumb in a table saw. The Cummins diesels, turning four-bladed propellers, give the 37 a cruise speed of 15 knots. Fuel burn is 7.2gph per engine, Tom reports. Joan and Tom live near the usually rough Strait of Georgia, and their boat, Aloha Kai, sees the strait often. "The boat handles it very well," Tom says. They found an opportunity and seized it. While Tom says they probably wouldn&apos;t do it again, their effort gave them what no one else has-a "new" 37 Tollycraft. The Lundegaards redecorated the interior with skill and artistry. The overhead is paneled with grooved white mahogany strips, and the furniture is upholstered in leather. The side panels of the saloon were painted by an artist, and granite countertops were used in the cockpit sink, the galley, and the head. New teak parquet with hardrock maple accents was laid on the saloon sole. A new ladder-one that is easier and safer to use- was built for access to the bridge. Its treads are made of Trex, a gray-toned man-made decking material that is impervious to weather. Thin channels were routed in the treads to simulate teak planking. While many Tolly owners replace upholstery, window covering, and carpeting, I&apos;ve not seen any others go as far as the extreme makeover by the owners of Carefree. But the Lundegaards have demonstrated how a stout, but dowdy, boat may get an attractive new look. While Carefree essentially is an exciting new boat, and folks lined up to inspect her during the club rendezvous, it&apos;s not necessary to spend that much to keep a Tollycraft up to date and purring. Paint, carpeting, and varnish will do much to banish that dowdy look. Repowering with diesel engines makes sense for those who plan to cruise extensively. 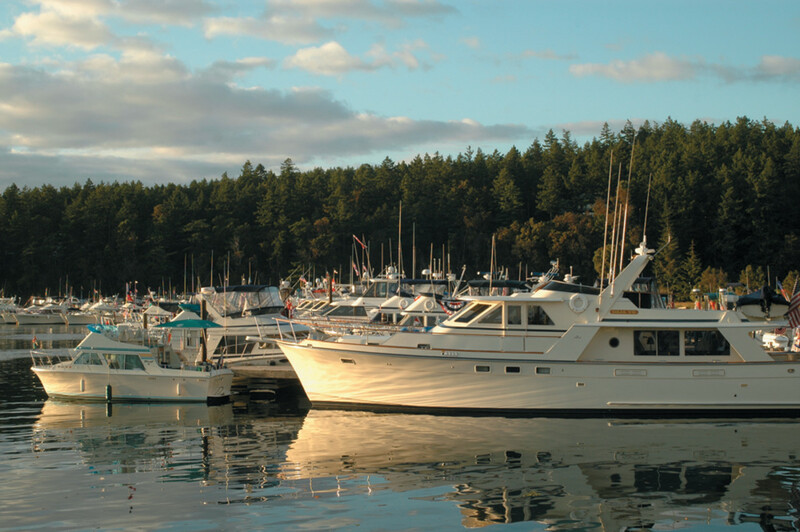 Tolly owners who take their boats out a few weekends in the winter and for a month in the San Juan Islands in the summer probably are wise to stick with the original gasoline power, as long as the engines are well maintained and reliable. Although it&apos;s hard to imagine buying gasoline, at today&apos;s rising prices, for a boat equipped with a pair of 454/cubic inch engines, it&apos;s the thing to do for limited cruising. (For a boat going to Alaska or Mexico, I&apos;d sure look for a diesel-powered Tollycraft.) Gasoline engines have a shorter life expectancy than diesels. Nevertheless, there were many 20- and 30- year-old Tollycrafts at the rendezvous with their original V8 gas engines still in service. Tom Lundegaard says the 315hp Yanmars cruise Carefree at 18 knots, while burning 16gph. She runs faster and uses less fuel per hour than when her engines burned gasoline. Beyond the 37 is a bewildering array of boats in the 40-foot range-sport sedans, sundeck models, tri-cabins, motoryachts, and cockpit motoryachts, with the 48-foot cockpit yacht probably the standout among them, followed by 53-, 57-, 61-, and 65-foot yachts. Don&apos;t overlook the others, especially those in the 30- to 40- foot category. The 34 tri-cabin is a popular small yacht, and one that seems capable of any voyage. However, twin 270hp gasoline engines are a decided disadvantage for serious cruising over long distances. Many of the 40s are diesel powered. 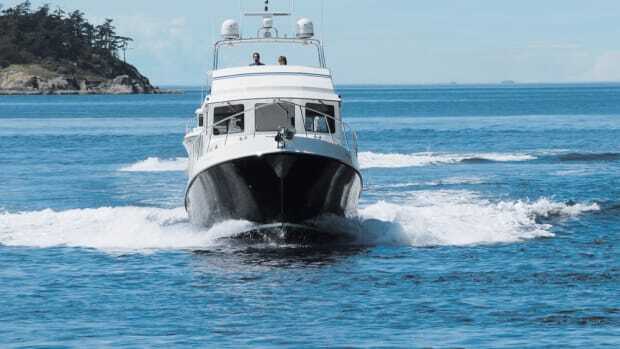 The 43-foot motoryachts and the 44-foot cockpit yacht are popular; both frequently are fitted with diesels for good long-range cruising. We see many Tollycraft yachts of all sizes whenever we head north along the Inside Passage. Some of the smallest boats carry little fuel, and owners must watch its consumption carefully. Others, with big engines and the capacity for high speed, seem to be content to run at displacement speeds, possibly because of fuel costs. Ken and Rheta Pearson own a 1985 43-foot motoryacht, the last of that model to be built. The Pearsons are devoted not only to their yacht, which looks better than new, but also to the Tollycraft family. Ken and Rheta have been officers of the Tollycraft club for 10 years. Ken was commodore in 1999 and Rheta finished her term as commodore in 2005. Club members and officials have their priorities straight-they take the summer off for cruising. The Pearsons, who cruise occasional weekends during the off season, head north into British Columbia for six weeks each summer aboard Jubilee, which they&apos;ve owned since 1992. OK, Ken, what&apos;s so great about a Tollycraft? "The quality of construction, the design, the integrity of the boat," he responds quickly. "This is a solidly built yacht that never will be duplicated. Tollycrafts hold their value, and there also is the prestige of owning one. The integrity and craftsmanship have endured for generations." OK, Ken, what&apos;s so great about owning a Tollycraft? "Out on the water, we see a Tolly anchored and it&apos;s like...family," he says. The events the club sponsors are built around family activities, and I saw a good number of children on the dock. One morning I had to step around kids who were playing organized games on the dock with marina staff. "There&apos;s a warm, family atmosphere here," Ken tells me. The relationship extends to Tolly himself. Every January, the club throws a birthday party for the retired builder at a Seattle hotel. Ken was the master of ceremonies on Tolly&apos;s 90th birthday anniversary in 2001 and reports that 370 people attended. Tolly&apos;s family is long-lived, and he expects to attend many more parties. My knock on Tolly boats? The faux teak fiberglass planking on exterior decks is durable, but over the years, it becomes mottled and just plain looks ugly. Some owners have learned that the simulated-teak decking looks a lot better with a coat of paint. Newer boats have fiberglass decks with a nonskid surface. On some older boats, the dwarf-sized doors to the helm area bother me. I find myself bending like a paperclip to move from the side deck to the helm. There&apos;s nothing that can be done to make them more convenient, however. Frankly, I don&apos;t like the traditional "Tolly Teal" color used for accent striping on older boats. It was out of date the first time it was applied to a Tollycraft and the color looks worse as it weathers. I know many owners worship the color and refresh it often and will tell me I am wrong. I have read criticism of the quality of woodwork in outof- sight places, such as staterooms and heads, and it&apos;s likely some boats may display something less than a perfect finish. But I think generally that Tollycraft craftsmen performed with skill. What do I like? The good work of Ed Monk-both Ed Monks, in fact-and of Tollefson&apos;s boatyard. Ed Sr. started his career building wood ships during World War I and then moved on to design and build workboats, fishing boats, and yachts. He built yachts for his family&apos;s use and lived, and kept an office, aboard. He knew what worked. His son favors the Euro look and has designed many large custom yachts, as well as the entire fleet of Ocean Alexander boats. Builders-Sunnfjord in Tacoma, Washington, and Park Isle Marine in Victoria, British Columbia, for example-continue to build yachts from decades-old hull designs by Ed Sr. They are strong, seaworthy, and designed to carry crew and cargo home safely. Tolly built strong boats, either of wood or fiberglass. Hulls were always solid, handlaid fiberglass. The company used balsa and foam coring in some deck structures, but I couldn&apos;t find anyone who remembered any Tollycraft having significant structural problems. We may nitpick his choice of decking, paint colors, and, occasionally, interior finish, but there seems to be no argument that the Kelso plant turned out good boats. For 25 years, Earl and Barbara Hughes of Olympia, Washington, have been cruising Pacific Northwest waters on their 1964-model 27-foot Tollycraft. Lady Bee II is built of mahogany plywood with a fiberglass coating; she is one of the last wood Tollys. We frequently hear that glass over plywood is not good, that eventually water will penetrate and cause rot. That&apos;s not a problem for the Hugheses, who obviously take good care of their boat. Seven years ago, Earl sanded the hull smooth and clean and sprayed on Imron paint. It still looks new. They keep her in a boathouse in Olympia, which is good for a wood boat. He installed a new 350 Mer- Cruiser gasoline engine to replace the original Gray Marine engine. Lady Bee II carries only 100 gallons of fuel, but Earl added a FloScan fuel meter to help him maintain the most economical cruising speeds. He cruises at 12/13 knots, getting 1.5 miles per gallon. "She was a 1964 Nash Rambler," Earl jokes. Come on, nothing could be that bad. "We just love it," Earl says. "Barbara and I are out for a month or so, cruising the San Juans." Joanna and Jerry Olmstead of Anacortes, Washington, have owned their 26 Tolly for 20 years. "She&apos;s so seaworthy," Joanna says. Strike Two is moored under cover, and looks new because of it. Even the Tolly Teal cockpit deck looks fresh. She&apos;s been repowered and burns 7 gallons of gasoline an hour while cruising at 12 knots, Jerry reports. At full throttle, she will do 18 knots. The only change the Olmsteads made was to enlarge the rudder, a move that sometimes is an issue of debate among owners. But to Jerry it made sense. "She is much more responsive," he says. To me, the 48 Tolly always has seemed the ideal cruising boat. After spending time aboard Gary Nelson&apos;s Done Workin&apos;, I knew I was right. Nelson, who moved up from a 37 Tolly about a year ago, and his wife cruise their 48 sedan- which Tollycraft calls a convertible-in Northwest waters May through September. Then they take off in a motor home, occasionally stopping at their Yuma, Arizona, home. The sedan, which shares a softchined semi-displacement hull with the 48 tri-cabin motoryacht, has a generous cockpit, a roomy saloon, and a down galley that is considered "part of the party" because it opens to the saloon. Nelson says his 1986 model is the last of nine 48-foot sedans/convertibles built by Tollycraft. The sedan is such a rare model that some listings of Tollycrafts fail to mention it. While the aft-cabin 48 offers the privacy of staterooms fore and aft, the open cockpit and the spacious saloon make the sedan a winner for me. In the year that he has owned the 48, Nelson has added a washerdryer and a watermaker. Done Workin&apos; is powered by a pair of 485hp Detroit 6-71 diesels. She will cruise at 17 knots, Nelson reports. The grand yachts of the Tollycraft fleet must be the 61- and 65-footers. With a raised pilothouse, covered side decks and cockpit, and a low, seaworthy profile, they do well in seas anywhere-but particularly so in the Northwest. Roy and Diane Jurgenson invited me aboard their 61, Anne J .
Jurgenson owned an earlier 61 for many years, sold it, and bought another kind of boat and cruised it for a couple of years. He says it became apparent the 61 Tolly was the boat they really wanted, so they bought another and refurbished and decorated it. Her saloon and galley share the same space, but there is so much room in this huge boat that meal preparation doesn&apos;t interfere with activity in the lounge area. Anne J has three staterooms, a flybridge, a bow thruster, and stabilizers. They have taken her to Alaska and to Idaho, via the Columbia and Snake Rivers. Although the 61 is reaching the size at which some owners would hire a captain, or other crew, the Jurgensons handle the large yacht themselves. Tollycraft built 39 of the 61s between 1983 and 1992. The failing company built 13 of the 65-footers between 1993 and its closing in 1997. The 61s sell for nearly a million dollars today. The 65s command prices reaching toward $1.5 million. That&apos;s the top to protect his retirement investments, as the company&apos;s future looked shaky in the post-Tolly years. Since 1992, he&apos;s been the man to see for Tollycraft parts and information. Working from Port Orchard, Washington, as Resources International, Inc., he uses the Internet and telephone to solve problems raised by Tollycraft owners, answer their questions, and sell parts. He has patterns and plans and knows where to buy original gear for the fleet of aging boats. He keeps track of problems that develop, issues advisories, and offers maintenance and repair tips. In 1992, Graham recalls, Tollycraft administrators began throwing records away. "I said, &apos;Let&apos;s put them in my truck.&apos;" His collection of paperwork is so complete that he was able to find the original invoice, complete with engine serial numbers and prices for options, for a used 37-foot Tolly a friend of his purchased recently. Graham&apos;s records show Tollycraft built 3,506 yacht-type boats from 26 to 65 feet between 1966 and 1991. They came in many styles: double cabin, express, sedan, sport, convertible/sedan, tri-cabin, sportfisher, sundeck, and motoryacht. Earlier, the company built several thousand smaller runabouttype craft. Tolly sold the company in 1987. The buyers declared bankruptcy in 1993. California interests arrived with new money and pulled it out of bankruptcy, but one of the major investors died in a helicopter crash, and, lacking operating funds, the business soon failed. After hanging out at the Tollycraft Club rendezvous for a couple of days, I was impressed by the two families I found-the people and the boats. Buying a Tollycraft and joining the club would be like marrying into a large Italian or Irish family. Imagine having dozens of cousins, aunts, uncles, parents, and grandparents all looking out for you. That&apos;s the way the club seems to operate. One owner may tell another he&apos;s crazy to do such and such, but then he&apos;ll offer what might be a better idea. The people with Tolly Teal on their boats are warmhearted and fun. I&apos;ve seen this at Grand Banks rendezvous, so it&apos;s not unique to Tollycraft. With boats up to 30 years old and ranging from 26 to 65 feet, there&apos;s a size and a price for everyone. Beginners to boating, and those with limited budgets, can start with the smaller and less expensive boats. I saw young couples at the rendezvous aboard aging but spotless 28-footers, for example. There were families with youngsters on 30-foot-plus cruisers, all apparently having a good time. People who want something for weekend jaunts can find a Tollycraft that works for them. With bigger budgets, more experience, and more time, long-range cruising is next, and there is an incredible array of Tolly boats that would do well in coastal and ocean cruising. 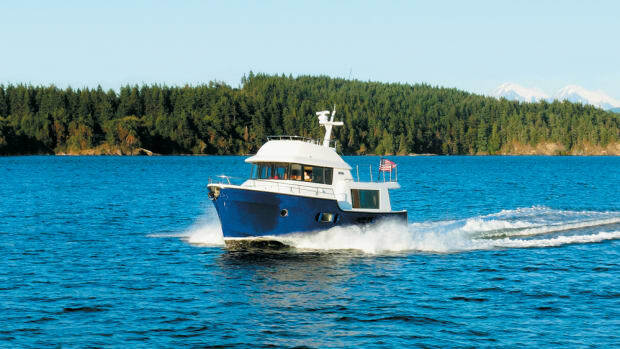 Because they are found the full length of the Inside Passage in the Northwest, and on cruising waters elsewhere in the United States, there&apos;s no question that Tollycrafts are capable yachts. True, many Tollycrafts have big engines and go fast. But I think we&apos;ve gone beyond the idea that cruising only means going slow. Cruising is a lifestyle, not an expression of speed or of boat design. Ed Monk Sr. and his son knew about cruising. So did Tolly himself, who cruised the coastline every season on a new yacht from his factory and who loved his blue-hulled 48, the last boat he owned and operated. Tolly and the Monks set standards for quality work, so it&apos;s no surprise that their boats are going strong after decades of use. So, maybe there&apos;s a Tollycraft waiting for you. If you can find a 37, give me a call. Robert Merland Tollefson, the boatbuilder the world knows simply as Tolly, lives quietly in retirement in a home overlooking Port Ludlow, a small cove off Puget Sound not far northwest of Seattle. The view from soaring windows is of the harbor, a marina, and the parade of yachts that come to anchor in peaceful waters. In his mid-90s, Tolly doesn&apos;t get out much. His body is frail, but his mind is not, and he enjoys reminiscing and sharing boating adventures. His adventures are monumental: Founder and owner of Tollycraft Yachts, he built thousands of boats, from plywood runabouts to full-blown luxury yachts, in a career running from the 1950s to the late 1980s. Boating memorabilia-paintings, sketches, photographs, line drawings-fill the home he shares with a caregiver. A montage of photographs of a fleet of Tollycraft yachts fills a stairway wall. In his bedroom, he keeps a drawing board, binoculars, and a handheld VHF radio. Tolly greets us and directs us to his office. He is dressed in hip boating attire: Topsiders, black jeans, and a black T-shirt bearing the Tolly logo (a gift from Tollycraft owners in Canada). Silver hair is swept back from his forehead. He boated until he was 92 years old, the final years in his beloved 48- foot, blue-hulled Tollycraft motoryacht. "It was difficult to give it up," he says, "but it was stressful and I found I was not as good a boat handler as I had been." Born in Idaho and raised in Oregon, Tolly began boating as a youngster. His college career halted by the stock market collapse in 1929, he began a career in real estate in Kelso, Washington, and built his first boat, a 36-foot woody. He served in the Coast Guard during World War II, including 18 months as skipper of a 150-foot oceangoing tug in the South Pacific. After 4 1/2 years with the Coast Guard he returned to Kelso, and, with partners, bought a millwork plant and began building a 58-foot yacht for himself. When the mill burned, he switched to boatbuilding, beginning with 14- and 16-foot runabouts. In the 1960s, Tollycraft began building fiberglass yachts and found a hit in its 26-footer, of which nearly 900 were built. Financially conservative (his father was a banker), Tolly did well in a difficult business by managing money carefully, avoiding debt, and running a tight ship, with only a small administrative staff. "I learned early in the game that you don&apos;t build for inventory, you build to fill orders." Another reason for success, he adds, smiling at my wife, Polly, is that he listened to what women wanted on boats. "Once, on a cruise, a woman said we needed a breadboard. I went back to the factory on Monday and put it in effect." In 1987, at the age of 76, Tolly sold his company. It was a good buy. Tollycraft was selling up to 150 yachts a year, with sales income of $18 million to $20 million. He retired to a condo in Edmonds, Washington, and spent a lot of time cruising. He doesn&apos;t say much about it, but it must have been agonizing to see his once successful company slide into bankruptcy and finally close in 1997. "It hurt," he recalls. "It was hard on employees. We had three generations of some families working there." Tolly opened a folder holding his recent drawings of dreamboats. They were handsome, no-nonsense yachts I believe would appeal to many. It&apos;s a shame none will be built. A couple of hours with Tolly seems like minutes. We talked about favorite boats and other icons of Northwest boating (particularly his designers, Ed Monk Sr. and his son, Ed Jr.). Never married, friends and boats were his life. Long after retirement, he attended gatherings of Tolly clubs throughout the region. He&apos;s had to give that up. But last spring he boarded a 61-foot Tollycraft that joined 18 other Tolly-built boats in an honor position in the Seattle Yacht Club nautical parade marking the opening day of boating season.